"Thank you all for an excellent job on the specialty business card project! Everything from the personal customer service to the foil, the custom pms color and the die cut was top notch and the cards came out FANTASTIC! I will definitely use you again for specialty printing." We all need to stand out from the crowd occasionally, and this rings true when it comes to your printing and marketing materials. While the list of options, colors, papers and finishes is extensive, one unique custom feature that can set you apart is the use of a die cut. What exactly is a die cut, how are they created, and how do you use die cutting to really stand out with your printed piece? A die cut is created by using a sharp steel blade formed into a specific shape, then used to cut through the paper. Think about how a steel cookie cutter would work; just substitute the dough with paper. The shapes for die cutting are nearly limitless—circles, squares, holes, curves, stair-stepped, rounded corners, sharp points, just to name a few. The die cut form, or "die", is customized to your artwork, and it creates a very crisp, smooth edge that can include fine detail and a very distinctive look. Standard blades can only cut straight lines. Hear one of our print consultants explain the process. How is die cutting done? 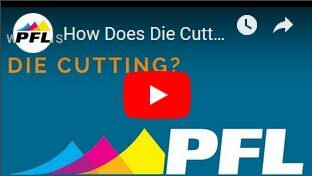 Die cutting starts with a die consisting of a sharp thin metal blade formed into the shape that will be cut out of the paper or other substrate. The die is embedded into a block of wood that is securely held in a die cutting press. The paper is fed onto the die and they are both pressed under pressure against a metal plate or cylinder, cutting the shape into the paper. In most cases, tiny uncut ticks are left around the edge of the shape to hold the cut shape in the parent sheet until it can be stripped out later by hand. This is done to facilitate easier handling of the die cut sheets of paper during processing. The products you can use die cuts on are wide ranging. Many people add eye-catching details to their business cards with die cutting, but you can also use the process on door hangers, brochures, postcards and presentation folders, to name a few. 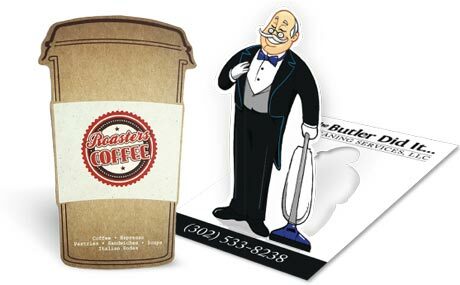 Done well, a die cut can direct the reader to the most recognizable aspects of your business or your offer. Your logo or product is the obvious place to start, but what else can you do to add a creative spark to your brand? As you look for ways to add a die cut to your piece, think about the purpose of it, and what kind of message you want to deliver. Are you looking for a classic shape, such as an effect of a family crest or scrollwork? Or perhaps something wild or unique, like the top of palm tree, a car, and the wings of a bird or even a butterfly, as seen here? Your industry can provide additional creative direction. Construction companies, real estate agents or architects could use the outline of a roof or building, restaurants perhaps could use the corner of a napkin or even a fork or basil leaf; the possibilities are nearly limitless. The real benefit of using a die cut is to get a potential customer to do a double-take, take a closer look, and check out what you have to offer. Sometimes it is that critical few seconds that can result in your business card, brochure or rack card being ignored or held onto and followed up on, just because of a unique finishing option—the multipurpose die cut. Need creative or technical advice on using die cutting on your next project? Check out our full line of custom printing effects and finishes.